Here we talk about three different types of delineation devices. Delineation is basically the act of separating traffic or keeping traffic away from a certain area. This can be important in toll booth lanes, parking lots, college campuses where you have foot traffic and pedestrian traffic and in a lot of other scenarios. 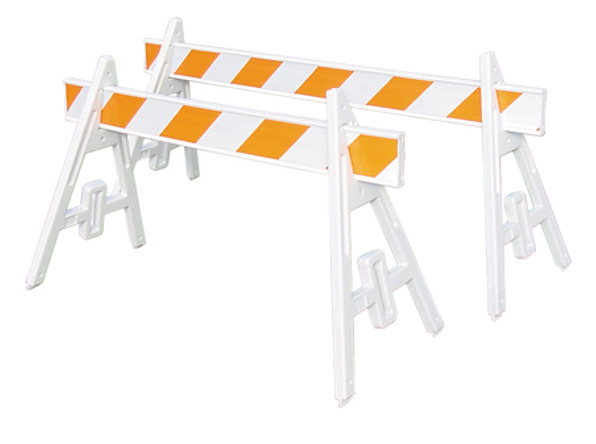 Parade Barricades are great for blocking off road ways and separating motorists from events like parades, food festivals and more. They have a ‘friendly’ look than a typical orange traffic control device. They also are longer and will cover a greater distance for each unit. Ringtop Delineators are good for when you are separating traffic in parking lots, warning pedestrian of construction zones and alerting people that a working area is coming up. These are very affordable, and portable. The ring on top makes putting caution tape or plastic chain link fence through easy.